We take pride that our customers refer to us as the best epoxy garage floor company in Jacksonville, FL. They say that because we produce beautiful epoxy garage floors that are durable and also Guaranteed. There is a big difference between the epoxy paint you buy at sherwin williams and the floors that we are installing. We prep your floor, grind the concrete, put down a coat of epoxy that seals to the concrete followed by broadcast of flakes, based on your color preference, followed by a clear coat of polyaspartic. This flooring system will make your garage beautiful and also protect it from harm. Real estate agents even tell us that it increases the value of the home when you go to resell. So, what's the difference between that high end luxury auto showroom downtown and your own garage? We'll forget the value of the vehicles for a moment. Chances are that the showroom features glossy colored flooring that shines and reflects the lights so it looks like you could eat off it. And it doesn't have discolorations from that oil spill in the corner or those dirty tire marks all over. So how do they manage that? You already have an idea – it's an epoxy floor covering over the concrete sub floor that guarantees great looks, practicality, low maintenance, and best of all... you can have it too. Jacksonville Epoxy Pros are the experts in installing epoxy floor coverings for your garage that will totally transform the look and the usefulness of your space. Give yourself a garage you're happy to spend time in, and show off to others. There are a lot of reasons why you would choose an epoxy floor for your garage but we're betting that the number one is simply how good it looks. Auto showroom glossy floors are the way to go and not only does your beloved auto deserve a home of this caliber but you know you're going to feel good every time you go in there. Epoxy flooring surfaces are also popular in industrial usage due to multiple safety factors. They can be heat and fire resistant and can be made to be non-skid in areas where you expect vehicle or foot traffic. They are easier on the wheels of delicate equipment too – one of the reasons why they are so popular with aircraft hangars but that also extends the life of your warehousing trolleys and vehicles. Epoxy floors are also chemically resistant which makes spills, including oil, much easier to deal with and less likely to leave any kind of mark. Which is why they are a popular choice in medical and food installations. ​Industrial Epoxy floor coatings are some of the most hard wearing surfaces you can have underfoot but we know they are also often some of the most hard working too. The nature of epoxy means they are less likely to get marked or stained, and the fact that an epoxy floor surface is perfectly seamless gives dirt, liquid spills, and germs with no place to hide. They can be wiped clean, and easily washed – when you can that is. 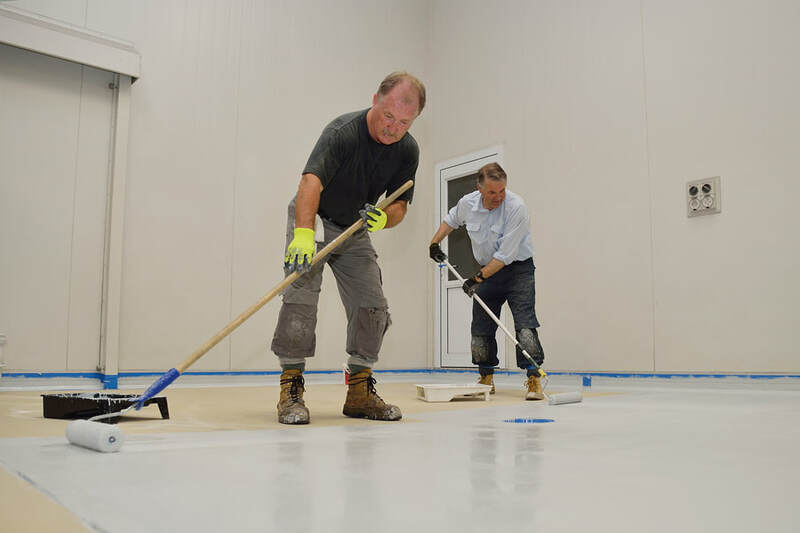 Because we also know that many floor surfaces in industrial use won't get the regular cleaning they perhaps deserve, and frankly a lot of customers choose epoxy flooring because it keeps on looking good even when that's the case.